When it comes to footwear, comfort is one of the most important things. 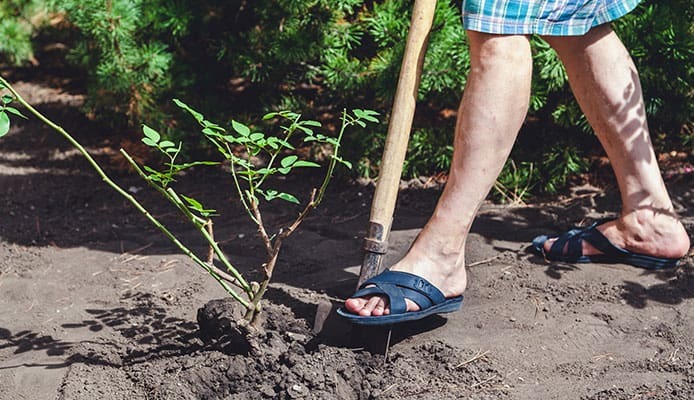 This is especially true during certain periods of the year – when it’s warm outside and we want to avoid wearing shoes or sneakers. We need something more appropriate and lighter, which allows our feet to breathe. Of course, several types of footwear fall into this category – sandals, flip-flops and slides among others. There are several advantages slides have over other types we mentioned. For example, they are more convenient to use in some situations while still giving you the same level of comfort. Like all footwear, not all slides are the same in terms of design and overall quality. We strongly believe that it’s worth investing in a good pair even if it costs a bit more. In order to help you find the best slides, we’ve selected some great products to make your choice a bit easier. Furthermore, we’ve compiled a buying guide to discuss the features you should look for when buying, so take a look. 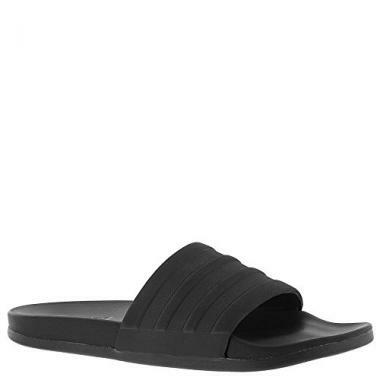 The Benassi Athletic Sandal is a fantastic slide made of high-quality synthetic materials. Nike makes it as a single piece which increases the longevity because there is a smaller chance of tearing. The Phylon injected midsole does the work of an outsole, reducing the total weight and making the slide more comfortable. The footbed features Flex grooves that help the slide move with your foot for a more natural step. 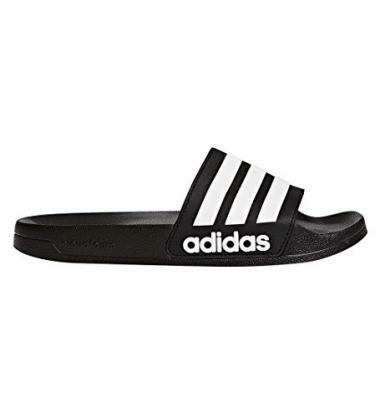 This lightweight slide has a soft upper with good padding, and there is a large brand logo on top. You can get it in many sizes (ranging from 4 to 18), and also many colors to make things more interesting. Like we said, they show solid durability while giving your foot excellent comfort at the same time. Many people choose these slides above others, and say they have a premium feel on their feet. As for size, they run a bit small. For this reason, it’s recommended to go with a larger number if you are unsure. Also, Nike gives you instructions on how to properly measure your foot, so you can compare it with the product and get the right size. These are men’s slides, but this doesn’t mean women can’t wear them. However, if you’re a lady, make sure to go with one size smaller, and you’ll be good to go. On top of everything we mentioned, these are cost effective too, and you can get them at an affordable price. They are really one of the best slide sandals you’ll be able to find, especially in terms of value for money. Under Armour is another renowned sporting goods manufacturer, and their slides are some of the best products on the market. The Ignite V slide is available in 10 color combinations and a large range of sizes so anyone can find their fit. It’s made of high-quality synthetics with a smart design which increases the comfort. The footbed is lined with a double layer of their patented Performance 4D foam which feels fantastic under your foot. It’s somewhat similar to memory foam, so it takes the shape of your sole making it comfortable for every foot type. In addition to this, it’s anatomically shaped so it gives you additional cushioning from the sides too. The outsole is made of EVA which gives the proper support, and isn’t easily destroyed when walking on rough surfaces. All this combined makes the sole very thick but at the same time you have a very soft sensation when walking. An additional upside is the adjustable upper over your insole. You use the Velcro strap to set the desired tightness of the slide, so you always have a good fit and a smaller chance of slides falling off. On the inside, the upper has HeatGear lining which warms your foot for a nicer feeling. When talking about size, customers say it runs pretty true. However, if you usually wear a half size, you should go with a larger one and then simply tighten it if you need to. These top rated slide sandals offer you great style and functionality, and if you properly take care of them they will easily last for many years. This is one of the most interesting designs we featured on this list. These mens slides are synthetic (like others), but have a different type of footbed to make walking more pleasant. They are lined with ergonomically shaped massage nubs which are strategically spread throughout. The nubs really create a relaxing feeling, like you’re walking on foam. Of course, the upside compared to foam is that these don’t absorb water, meaning they will dry very quickly. The outsole is made of injected EVA, which makes these slides very light. In addition to things we mentioned, the sole is very flexible which indicates it’s better at following the contours of your feet when you walk. The upper has a very nice Adidas logo and their recognizable stripes on the sides. The bands are connected with Velcro, which allows you quick and easy adjustment no matter where you are. The step feels very secure, as these offer greater stability than many other products out there. You have 5 color choices when buying these, including white and red. Adidas also gives you a huge choice of sizes, ranging from 3 to 18 US, so you will easily find a pair that fits you. When you first buy them, you’ll require a bit of patience – they can feel a bit tough and need some breaking in. After the initial period, customers say they are among the best slides they’ve ever used, so you can be sure you won’t go wrong with these. If you are a fan of classic Adidas slides, this Adilette is what you’re looking for. It first appeared on the market over 45 years ago, and the fact that it’s still available today says a great deal about the design and quality. The outsole is made of polyurethane, which guarantees strength. They won’t be damaged easily no matter what you walk on. Heel height measures approximately 1”, and there is a slight decrease in height towards the toes. The footbed doesn’t have any foam or lining. However, it is ergonomically shaped with proper support in all the right places. This makes them easily comparable with many products featuring a foam footbed, and these are in no way inferior. In addition to this, the upper is strong and durable. It’s also synthetic and it has a polyurethane coating. On the inside there is a lining which makes the upper feel more comfortable against your insole. Also, the lining material dries quickly which is a plus if your feet get sweaty or you use these after swimming or taking a shower. The upper has three horizontal Adidas stripes, and many people like it. These sport slides come with many color and size options too, making the choice a piece of cake. It really is one of the most recognizable slides in the world, and there are very good reasons for people buying it over and over again. Here we have one more product from Adidas, which is (as the title suggests) great for shower and pool use. 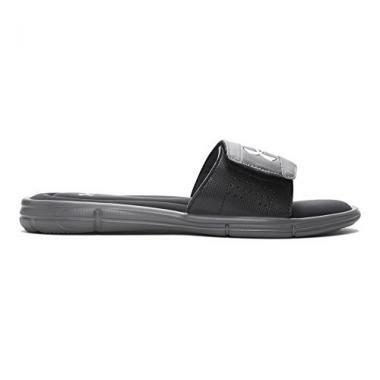 These slides for men have an EVA outsole in combination with soft Cloudfoam footbed. This combination gives strength and stability, while at the same time being amazing to walk in. The footbed is lined with suede which feels great against your feet. The upper is also made of synthetic materials, but it’s elastic and very comfortable. You won’t be able to adjust it, but you can rest assured it will have a snug fit against your insole without cutting into it. The mentioned upper has three horizontal stripes on it, which look really nice because of the contrasting color. These pool slides come in 5 colors – black, white, red, navy and grey. Sizes range from 4 to 13, so unfortunately there are no extra-large numbers available. Also, unlike many other Adidas products, these tend to run a bit small so be careful when choosing. An added benefit of these if that they are affordable, so no matter if you’re buying them for yourself or considering a gift for swimmers in your family, these will certainly be worth it. The Locker III slide is one of the most particular products featured in our slides reviews. This slide is completely made as a single piece – there are no stitches or glued parts anywhere to be found. The only material used is EVA (ethylene vinyl acetate). It’s performance molded, and we already praised the many qualities EVA products have. Everything on this slide (strap, footbed and outsole) is designed in such away to drain water efficiently. The sole even has drain holes at strategic places so that water can quickly find its way out. Given that these slides don’t have any fabric lining inside, it means they dry amazingly fast. All this makes them probably the best choice if you’re looking for slides for swimming or gym. They are anatomically shaped, so even though they don’t have additional cushions the feeling is still good when wearing them. As for size, it’s pretty accurate. You should buy them in your standard shoe size since there is a large chance it will be a perfect fit. All adult sizes are available, including those for people with large feet. Finally, you have a choice of three colors (black, navy and red), and all of them have a large silver Under Armour logo on top. The Solarsoft Slide Sandals from Nike are made with an accent on style. They feature a fractal design which looks very interesting and cool, and stands out compared to other boring slides you are able to see at your swimming pool. In addition to this, you have numerous color combinations to pick from. This includes some very bold and vibrant colors, and slides with logos of your favorite sports teams on them. They come in every size, so any adult can own a pair of these. In addition to being stylish, these are very comfy too. This largely has to do with top-notch materials Nike uses. These have a rubber sole and a dual-density foam midsole which make this footwear very stable. In addition, the midsole creates a really plush sensation under your foot. The outsole pattern creates very strong traction allowing the most natural step without fear of slipping. As for the fit, the upper is made from soft and elastic materials which conform great around your foot. For a more luxurious feeling, the strap is padded on the inside so to eliminate any potential discomfort. These are really great to wear, and your feet won’t hurt even after long periods of having them on. These Adilettes are designed for comfort in any situation. We say this because they don’t soak in water, nor does water create any damage on them. You can get them wet all day long, and they will dry off quickly. It’s a well made slide with a rubber sole and a synthetic foam upper and footbed. There is no fabric inside, which is the reason they dry off so quickly. The rubber outsole is incredibly tough, while the foam creates a cloud-like feeling when stepping on it. The upper (band) is elastic and allows your foot to find the best and most comfortable position. In addition to things we mentioned, these are really good-looking too. Many users say they look much better in person than they do in the pictures. All this makes them the perfect pair to throw in your beach bag when you go to enjoy yourself on the sand. Like most product we featured, all sizes are available (including very small and extra-large). Additionally, you can get these in several color combinations, including camo versions. The Performance Superstar 3G are probably the most comfortable slides we have on our list. They are designed in such a way to give any type of foot ultimate comfort. This has to do with the mix of synthetic materials Adidas uses when making these. They have a fantastic Fitfoam midsole, which is made of visco-elastic rebound foam that quickly and easily contours around your foot, as if you were wearing custom-made shoes. It even has grooves in it which allow air to circulate and your feet to breathe so they don’t get sweaty. In addition to this, the upper is very soft and can be adjusted using the Velcro strap. The design is stylish too – there are three contrasting stripes across the band. However, you only have three colors to choose from – black, white and navy. They are excellent in the size department though, with a huge choice. Customers say these run true to size, so you don’t have to worry. They aren’t perhaps the best choice to wear around water, but if you’re looking for slides to wear in dry conditions, picking these is one of the smartest things to do. They feel great immediately – you don’t have to wait for them to break in and settle. The Solarsofts from Nike are a solid product made for casual wear. They are great for both indoor and outdoor use, because they are made in such a way that your feet don’t become tired. In addition to this, they are very breathable so your feet stay nice and dry. These top slider shoes have an outsole made of density foam for proper strength. On top of it, the footbed is fully lined with memory foam which takes shape of your foot to create a great feeling. The whole sole is extremely flexible, unlike many other stiff slides. The hexagonal traction pattern further increases the freedom of movement because it gives good traction on any type of surface. The upper is adjustable with Velcro. It’s lined inside, and when you tighten it, your foot stays in place without feeling any discomfort. The breathability we mentioned is in large part thanks to the upper – it’s has mesh parts to allow better air circulation. You’ll be able to get these in several different colors – black, yellow, blue, red and white. Many sizes are available for all of these. If you’re looking for slides to give you great support and all-day comfort, this is the way to go. Buying footwear is not always an easy task. We’re not talking just about size – there are more factors that need to be considered. Your new slides need to have the right fit and be comfortable. Also, they should be made from strong materials so they don’t tear while you’re wearing them. We’re going to break down all this criteria and more, so you can find a pair you will gladly put in your swim bag along with other swim essentials when going to the pool. When talking about size, slides usually only come in whole numbers. Luckily, as you had the chance to see in the reviews, they is a really wide array of sizes too choose from – including very small and very large. However, whether the specified size is going to fit you depends on the particular manufacturer. It’s well known that the same size from two different suppliers isn’t always going to fit the same, and it’s no different with slides. If you have previous experience with a brand and know their sizing, then it’s recommended to get the same size you usually get. Still, we can’t be familiar with all products, and the fact that there are no half sizes complicates things a bit. So, when unsure, always go one size up. The reason for this is that your foot will be positioned better even if there is some spare space. On the other hand, if the size is too small you may find the slides constricting and uncomfortable, especially in the upper area. In addition, don’t forget about the width either – if your foot is wider than usual you should consider going with a bigger pair. There are sizing charts and guidelines available for many products we featured, so you can measure your foot at home and get the proper size. Customer reviews can also be helpful, because you will read first-hand user experience and see how the slides you like compare to regular footwear. Finally, it can really help if the slides are adjustable, which we’ll talk about later. This is closely related to size, but it also has to do with slide design. They need to have a snug fit around your foot, especially since there is only the upper that holds it (unlike sandals which have support around the ankle too). 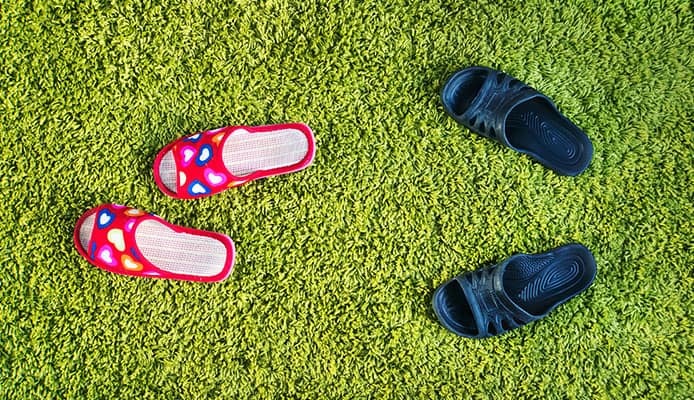 The best slide sandals offer enough room for your foot to slip in and find its place, but once your foot settles the slide isn’t loose around it. In addition to positioning and tightness of the upper, the shape of slide footbed contributes greatly to the fit. The right arch in the middle of your sole as well as a good heel cup stabilize the foot and make you feel like the slides were specifically molded for your feet. Pay attention to this, because nobody wants a new pair of slides that will come off constantly or even present a risk of turning your ankle and injuring yourself. Slide design if pretty straightforward – there is a sole with an upper connected to it, which covers the instep of your foot. This being said, you’ll be able to find many different styles on the market. The sole can be flat or contoured to follow the sole of your foot. The slides can also have a flat heel or a heel which is slightly elevated. As for the upper, it can be a single piece or multiple pieces (straps, bands) in different positions. Perhaps the most important thing when talking about styles is the adjustability. You will come across slides that have an elastic upper and those that allow you to adjust the tightness with buckles or Velcro straps. Elastic uppers are probably the most common. The material stretches around your foot so it remains snug and give it a good fit. However, some products can be too tight, especially if your feel swell a lot. In this case, the upper can cut into your foot causing great discomfort. In addition, elastic uppers do tent to stretch too much over time (especially on lower quality products), making your slides loose and useless. If you want to get a pair which you can adjust, you have two options – Velcro or buckles. Velcro straps give you a high level of adjustability, and you can do it quickly too. If you feet are swollen from walking or standing, or if you want to wear socks with your slides, just detach the strap and stick it again. On the other hand, it has some downsides too. It becomes weaker over time, and tends to collect dirt which can’t always be removed from it (decreases the efficiency). Finally, buckles are more durable but less convenient to use. They also don’t have the precision of Velcro straps because the holes are in pre-made positions. Comfort and convenience are some of the main reasons people choose to wear slides in the first place. You foot should simply “slide” inside and you should feel nice having them on. The cushion under your foot needs to be soft and flexible so it mimics the movement when walking. Some products even have memory foam footbeds to give you the best experience possible. It’s also a big plus if the lining on both the footbed and the upper wicks sweat. Alternately, some products have special holes created to drain sweat and water. Nobody feels comfortable when their feet are wet for a long time, and this helps them dry faster. Support is closely related to comfort, and we can even say it contributes to it. You will certainly feel more comfortable if the slides support your foot in the right places. Check whether the footbed is ergonomically shaped – it can stabilize your foot both from underneath and from the sides. This and the materials used help absorb the shock when walking, giving you a feeling that you’re treading on a soft surface. The choice of materials really determines whether a pair slides is excellent or subpar. A few boxes need to be checked when selecting material combination in order to make a really good product. First off, the slides need to be gentle on your feet. They should never cause blisters, chafing or any type of irritation to the foot. This goes for the material, as well as seams which should be hidden and not sitting against your foot. The upper is often made of synthetics, breathable mesh, or some other type of fabric (regular or knitted) and in some cases even artificial leather. The footbed should be soft from underneath but with firm support at the same time, so it’s good if it’s made of EVA (ethylene vinyl acetate), memory foam or some type of gel. On the other hand, slides mustn’t deteriorate quickly when walking on hard surfaces – this is why the outsole is made of tough materials. These is most commonly hard rubber or some other synthetic material which can withstand daily grinding without wearing off quickly. Your new pair of slides should last a while – it goes without saying they shouldn’t tear quickly no matter how much or little you paid for them. Some products can go for years without many signs of wear and tear on them. They even become more comfortable over time. However, we aren’t always sure how to recognize such a product. It helps that certain brand names keep their products up to a certain standard so you know what you can expect. We aren’t saying that you should only go with well-known brands – if you follow the guidelines we gave you, you’ll be able to find many slides that are really well-made. Each individual part needs to be made of quality materials, which we discussed earlier. However, sometimes we need to make compromises – materials which are soft and feel nice (mesh and foam for example) are often going to be less durable, so keep this in mind. Q: Why Choose Slides Over Flip Flops? A: Many people find slides more comfortable to wear than flip-flops. In addition, they are a great choice if you want something different to wear when warmer season comes, or when going to the pool. They are similar to flip-flops in terms of freedom your feet get – nothing covers your toes and heels. However, unlike flip-flops, there is nothing between your toes to cause you discomfort. A: This depends on the pair you get, but they shouldn’t be. We can talk about slides slipping on the surface you walk on, or your foot slipping inside the slide. If you’re worried about the latter, it can be avoided by getting a good fit. This makes your foot stable inside and keeps it in place. Furthermore, some slides wick away moisture, and dry feet are less likely to slip around. If you have this problem with your old pair of slides, some people suggest cleaning them thoroughly and then spraying the footbed with hairspray. While this is not a permanent solution, it can make things better for a short while. As for the other possibility we mentioned, a good slide should give you a secure step without being slippery. The outsole has grooves which are put there to improve traction no matter the surface you’re walking on. This includes wet surfaces too, like the locker room shower in your gym or walking alongside the pool. Manufacturers pay special attention to this, since they count on the fact you’ll be using these in some combination with water. While we’re on the subject of keeping you safe, it’s not a bad time to read more on some interesting facts about pool safety. In any case, slides are often much less slippery than flip-flops. Q: Can I Wear Slides On The Beach? A: Yes, of course! They are one of the best choices you can make, and they should have their place on every beach day checklist. Because of the design, your feet are free and allowed to breathe, meaning they won’t get too hot on a sunny day. You can quickly take them off when you want to go into the water, and easily put them back on when you get out to avoid walking on hot sand and sharp rocks. Most beach slides dry quickly, and when they’re dry you simply brush off the sand. Of course, if you feel your feet need more protection while you’re out on the beach, be sure to check out our selection of best water shoes. Slides are fantastic footwear with great versatility, making them useful in many situations. Everyone should get a pair, because you’re not really aware how comfortable your feet can be until you’ve given them a try. You will start using them around the pool, on the beach, in the gym and even regularly around the house because they’re so comfy. It all comes down to finding the best slides in terms of quality and fit. We hope our guide has helped you in making this decision. Feel free to pick any of the products we listed – you certainly won’t be disappointed! Have you tried a pair of slides that made it onto our list? Are they comfortable? Do they fit well? What about quality, are they durable? Please share your experience with us in the comment section below.